Many thanks to author A. M. Riley for donating a copy of her newly released m/m romantic suspense, Son of a Gun, for one lucky reader to win! Politics, drugs, and secrets from the past collide in the town of Boerne, Texas, and end in a chase across the Devil’s Backbone. 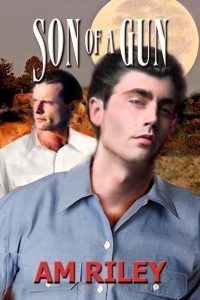 Read a review of Son of a Gun at Reviews by Jessewave. A. M. Riley is a film editor and sometime poet, living and working in Los Angeles, with an interest in paranormal, erotica, and anything that tests established boundaries. To enter, leave a comment stating that you are entering the contest. Contest closes 7 pm CDT, Wednesday, April 21. Posted by Chris on Wednesday, April 14th, 2010, at 2:00 am, and filed under Contests, Reading. I’d love to be entered for Son of a Gun :). Many thanks. .-= Tam´s last blog ..Hump Day yet again =-. A.M. Riley is one of my favorite authors. Please count me in. Aww, that’s an adorable picture of May. Kind of a terrible book cover, though. Unless maybe there’s a vampire or werewolf aspect to the story that didn’t come through in the blurb. Took me awhile to realize which side of you was up, May! Oh my what clean ears you have Mayhem! Please add my name to the hat for Son of a Gun as well. Thanks. No need to enter me, just dropping in for my daily dose of Kitties make me smile… Especially right now…… It is almost there… I can feel it…. UGH!!!!!! I hope you have a great day hon!!!! PS… Thanks for coming to my place like you do!!! It does mean the world to me that you peek over at my place! Hugs to you! 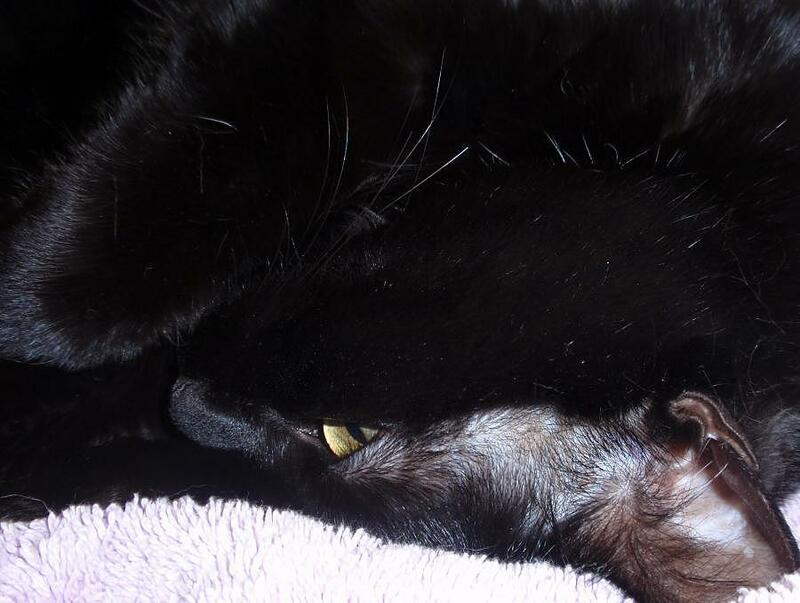 What an amazing panther princess talent: sleeping on the top of her head. I can’t do that – I’d break. Please count me in (though my first reaction to the cover was, “Where are the abs?”)! .-= Seanna Lea´s last blog ..building a lawn =-. And just so you’s guys know…that town in Texas is pronounced Berney. Crazy, huh? I love AM Riley. Pick me pretty please? If only I could sleep as well as a panther princess! and You’re always gorgeous and picture perfect at all times Mayhem! 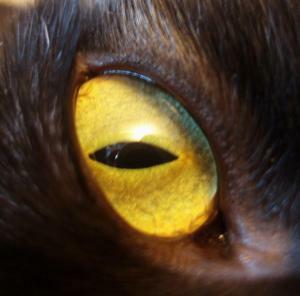 ::turns head:: still trying to figure out pic..is that his eye…is he upside down…? A nice review over at Jessewave’s, 4.5 stars! So yeah, please enter me. .-= Sarah´s last blog ..Shorts. =-. I’m with May. More sleep is required today. Yes, those are very clean ears, May. I know where Boerne, TX is!! It’s south of me, and it’s know for it’s craft in big truck accessories like Headache racks and brush guards made by Ranchhand. Wow! Small world. Don’t enter me, just stopping by to say hi to you, the beautiful panther princess and that too cute Mr. Chaos. One of these days I’m going to post a picture of my mom’s Tortie so you can see the most ineptly named cat ever. She’s adorable, but named for Haley’s comet and that cat never moves faster than her food bowl. Hey, I was just in Boerne (and Jason is correct – it’s pronounced “Berney,” in true mangled-German fashion) — I have several friends who live there. It’s just north of San Antonio and, despite the fact that there is still some countryside between it and SA, it’s quite suburban now. .-= janna´s last blog ..It’s a miracle! =-. I’d love to win this book. It sounds good. Sounds good Chris! Thanks for hosting..
Oh, please count me in as well. Sounds good. The guy on that book cover is making me nervous. Ahhh that’s better – May made it better. I am entering the contest. I look forward in reading it. I would love to win this book, Chris! .-= Eyre´s last blog ..WTF?!?! =-. I would love to be entered to win a copy of this book please? Thank you! Please enter me in the contest. Sounds like a very interesting book! Hi, Another intriguing book. Please enter me in the contest.